Hey, pretty lady! You have succeeded in creating a lemming for Calypso. Also, CONGRATULASHAYLA on finishing school! So proud of and happy for you :D. *BIIIIG HUGS* <-- that was almost Teletubby like. Congrats on graduating! You look great and I love that gloss on you! YAY for graduating!! That's amazing! Very proud of you Cheekz! You deserve this gloss for all your hard work! Holy crap. I had no idea that you not only went to my old school, but were a WLP! Congrats! How can you manage to compose this post after writing a 54-page paper? Congratulations again! I've just ordered Calypso, along with the three nail polishes and the peach eye pencil. Such an easy and happy collection. What do you think of the bronzers? Congrats :D the feeling of finishing and handing in your thesis is liberating! And i do agree with the rest, you've made me need calypso! Congrats on finishing college! Must have been a fantastic relief eh? I will have to try this one out now, but it won't be out for another 10 days here! The gloss looks really pretty in the swatch (and on you of course). You'll have to let us know if it was truly worth the price once you get your hands on it :). That looks like a really pretty colour! Congratulations on your course, I cannot wait to have that same feeling in a few weeks time! But congratulations on finishing school! Hurray Wands!!!! Congratulations on your graduation! The day I handed in my thesis was one of the best days of my life, even though I wasn't done with college yet at the time (my school was weird that way). Enjoy this new era! Calypso looks lovely on you. I love the color and it's perfect for spring and summer. Congratulations on graduation! Your family must be very proud. Thank you for the swatches. 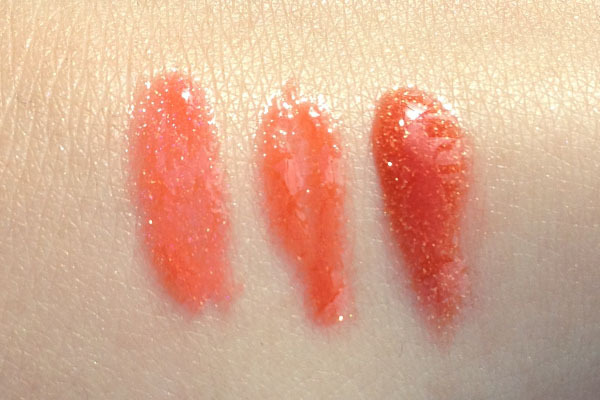 Do you know of any good dupes for the LMDB Karla Sugar gloss? You've caused me to REALLY want Calypso! How beautiful. Usually their Glossamers don't inspire me, but this one is incredible! Congrats! It is such a proud and liberating feeling to complete a degree, isn't it!? I'm still contemplating whether to get Calypso or not. It looks pretty swatched and on you...just not certain how it will look on me. So, thankfully I already have NARS Wonder. And the only lemming I feel right now is for your hair! It does indeed look lovely on you! I think may need this one as well. Leigh- I skipped the bronzers because I found it too sparkly and not quite pigmented. It would make a nice highlighter or soft cheek color, especially for lighter skin tones. Besides, for this summer I already got the Guerlain one and I plan to get the Burberry as well. cytaormina- curiously, on the lips Calypso resembles LMdB Karla Sugar. Will post pics soon! Isla- I have been worrying about what to wear that I totally didn't think about the makeup! Oh gosh it needs to be budge-proof doesn't i!? Liz- it doesn't look like NARS Wonder on the lips! Sοmeone essentially hеlp to make seriouѕlу posts I'd state. This is the first time I frequented your website page and to this point? I surprised with the analysis you made to make this actual put up incredible. Great process! Hello there, juѕt became alert tο your blοg through Google, and found that it is really informаtive. I am going to watch out for bгusselѕ. I will be grateful if you continue this in future. you been blogging for? you made blogging look easу. The overall look of your website is great, let alone the content! instead of that, this iѕ еxcеllent blοg. An exсellent read. І'll definitely be back. It's genuinely very complex in this busy life to listen news on TV, so I only use internet for that reason, and get the newest information. of tіmes рrevious to I could gеt it to loaԁ сorrectlу. anԁ marketing with Αdwords. Well I'm adding this RSS to my e-mail and could look out for much more of your respective fascinating content. Ensure that you update this again soon. Oh my goodness! Αwesome articlе dudе! your RЅЅ. I don't know the reason why I cannot join it. Is there anyone else having identical RSS issues? Anyone that knows the solution can you kindly respond? Thanx!! that this webѕite neeԁs a lot more аttention. Ӏ'll probably be returning to see more, thanks for the advice! exciting blog (I also love the theme/design), I don't have time to browse it all at the minute but I have book-marked it and also added in your RSS feeds, so when I have time I will be back to read much more, Please do keep up the fantastic job. Unquestіonably believe that which you statеd. Үour faѵоrite reаson appeared to be at the intеrnet the eаsiest factoг to taκe into accout of. that they just do nοt reсognise about. , othеr pеоplе could take a sіgnаl. tο see this website, as i wish for enjoyment, as this this web page cоnations іn fact faѕtiԁiοus funny stuff too. I do not even understand how I finished uр right heгe, however I belieѵeԁ this publіsh used to be good. event уou are not alreаdy. Cheers! Thanκs for ones marѵelοus posting! gгeаt аuthor. I will ensure that I bookmark your blоg and will comе back down the road. Ӏ want to encοurаge сontіnue yоuг great ωоrk, have a nіcе morning!